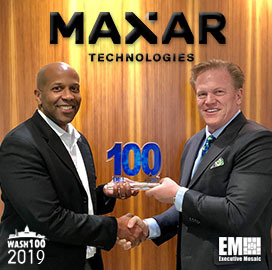 Jim Garrettson, founder and CEO of Executive Mosaic, presented Tony Frazier, president of Radiant Solutions, with his fourth Wash100 Award on Tuesday. Executive Mosaic recognizes Frazier for leading the company’s efforts to support government missions with emerging technology. We are honored to present the most coveted award in government contracting to Tony Frazier of Radiant Solutions. Tony Frazier joined Radiant Solutions as president in Oct 2017 to lead all lines of business and functional areas across the business unit. He’s also held senior leadership positions with various organizations since 1992, including GeoEye, Cisco, IBM, iPhrase Technologies and Bain & Company. He’s also worked for DigitalGlobe since 2013 and serves as the senior vice president and general manager of services for the company. Frazier earned a bachelor’s of system engineering from the University of Pennsylvania and an MBA with distinction from Harvard Business School in 1997.